Moving boxes, pallets, or barrels from place to place is an essential function of the distribution process. Cannon Equipment designs andmanufactures complete systems that can move just about anything. The experience and knowledge has enabled us to expand into additional industries. Most any processing or distribution center will benefit from a combination of automated equipment. Anywhere there is something to be moved, stacked, packed or loaded, automated equipment can be used. If your operation uses pallets to transport items, the use of a Cannon Equipment palletizer will increase efficiency by loading your pallets faster and safer than any manual loading. Does your operation put product into cases or boxes for shipping? Our casers are state of the art designed and developed to increase through-put. 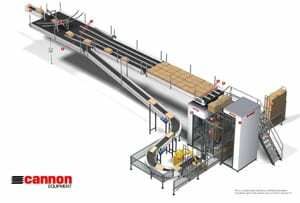 One of the nations leading snack products manufacturers trusted Cannon Equipment to develop an automated sorting and loading system for their production facility. Our team got together and developed an efficient system that included conveyors, sorters, lowerators, aligners, pushers, and an automated CannonCart® loader.